Two local businesses in Historic Downtown Frisco are joining forces to bring you an exciting monthly event. 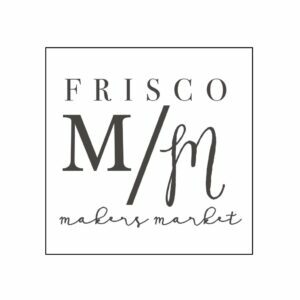 Lillian Welch and eight 11 place have joined forces to bring you the Frisco Makers Market. On the first Saturday of every month in the green space behind their neighboring properties, the event features local artists and makers and a selection of vintage treasures. Anne-Marie Lindsey and Ursula Clayton, proprietors of two of the community’s favorite businesses have come together to create an opportunity for crafters and artists. Excited by the possibilities, both ladies want provide a platform for local talent and bring together those who share a passion for all things handmade. The ladies have been working hard sourcing local talent, to making sure there are a variety of products to choose from. The Tilted Hourglass Company handmade goods: original art, crafts, needlepoint, repurposed treasures. Anna Cutler – original art & handmade dolls. Emily Mariani – watercolor artist and family photographer. There will also be a collection of antique and vintage goods, so arrive early for best selection. When you finish browsing, put your feet up in eight 11 place with a mimosa, enjoy some brunch, and the music of Ben Shurr. Or lose yourself in the serenity of the Lillian Welch store and enjoy some lemonade or try out their new Bellocq Tea range, utterly divine. Entrance is free so come out and support your local makers at this exciting new community event! Any crafters and makers out there who would like to participate, please contact Ursula or Anne Marie. Space is limited so get registered!